Kenyan Socialite, Huddah Monroe is currently in the US, having a good time after sharing photos with Mzungu baby daddy. When we mention, ´Beverly Hills´ this is definitely not cheap talk, spare the cash one forks in. Tip of the Iceberg! The stunning beauty is down at Waldorf Astoria, Beverly Hills, one of the most lucrative and posh hotels in the USA. This comes in just 4 days after launching her lipstick and cosmetic line. The add-on Additionally, Huddah poses with her to-be baby daddy, suggestively captioning: Many on social media are thrilled by the update, some offering to be nannies to a baby yet to be conceived. Sit tight and watch the drama unfold. 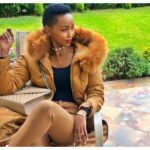 The post Here is Evidence that Socialite, Huddah Monroe is spending large in the US with Mzungu ´baby daddy´ appeared first on Ghafla! Kenya.